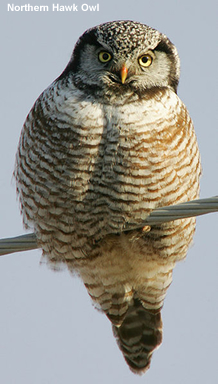 The Northern Hawk Owl (Surnia ulula) is a medium sized owl. The term "hawk" refers to its falcon-like wing shape and long tail. It is the only species in the genus Surnia. The species is sometimes called simply the Hawk Owl; however, many species of owls in the Ninox genus are also called hawk owls. This bird is 35-43 cm long with a 69-82 cm wingspan. It has a rounded head with yellow eyes, dark brown upperparts and barred underparts and tail. The song is a bubbling lulululululullululul. It is found in the boreal forests of North America and Eurasia, usually on the edges of more open woodland. This bird nests in large tree cavities or uses nests abandoned by other large birds. It has little fear of humans, and will attack if the young are appoached too closely. This is a partially diurnal owl (active during daytime), which hunts voles and birds like thrushes. It waits on a perch and takes advantage of its rapid flight to overtake prey. The Hawk Owl has exceptional hearing and can plunge into snow to capture rodents below the surface. It is not migratory, but occasionally irrupts south of its breeding range.